WireGriot (re)constructs a repertoire for solo voice that is actively challenged and enhanced by the use of technology through a shared desire to explore the blurry borders of contemporary music. 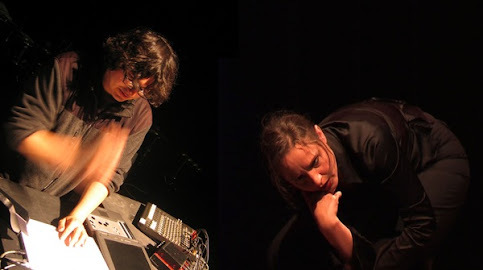 By showing the voice in three stages-highly exposed and alone, manically disguised, and calmly blended within an electronic albeit “natural” surrounding- Cora Schmeiser and Juan Parra seek contrasting ways in which a human voice can be used to express to both the cognitive and intuitive senses. Formado en 2006, WireGriot busca (re)construir un repertorio para la voz que sea activamente desafiada y estimulada a través del uso de la tecnología y un deseo común de explorar los límites difusos de la música contemporanea. Exponiendo a la voz en tres diferenes estados: sola y altamente expuesta, maniacamente oculta y calmadamente inmersa en un entorno 'naturalmente' electrónico, Cora Schmeiser y Juan Parra buscan maneras contrastantes de mostrar cómo la voz puede ser usada para expresar hacia los sentidos, tanto intuitivos como cognitivos. WireGriot just had a very successful row of short performances at the Orpheus Institute in Gent, Belgium, connected to the activities of ORCiM (Orpheus Research Center in Music) and a shared concert with the Scottish flutist Richard Craig. The future promises a closer collaboration with Craig, to be crystallized in a joint program to include new works by Mattias Sköld and S. Davismoon. More information will be posted as soon as the collaborations become more concrete. WireGriot ha completado un interesante periodo de pequeñas presentaciones en el Instituto Orpheus de Gent, Belgica, en conexion a las actividades del ORCiM (Orpheus Research Center in Music) y un concierto compartido con el flautista escoces Richard Craig. El futuro promente una colaboracion mas estrecha con Craig, que se cristalizara en un programa a incluir nuevas piezas de Mattias Sköld and S. Davismoon. mas informacion pronto, a medida que las colaboraciones se sigan concretando. Tu Recuerdo Manda, Juan Parra C.